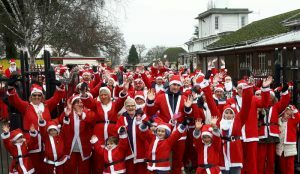 Join us for our annual Santa Saunter, a delightful 3km stroll around the beautiful lake at Wicksteed Park. There’ll be plenty of entertainment for the whole family, including an Elf Trail for the kids and prizes for the best-dressed Dog, with plenty more to be revealed over the coming months! We’re also excited to announce that Olaf and Elsa from Frozen will be visiting, giving everyone the chance to have a picture taken with the famous pair! Thank you to ‘Wish Upon a Party Northampton’ and ‘Party Spiderman for Hire’ for their support. Get into the festive spirit and help raise essential funds for Cransley Hospice at this exciting family-friendly event. Tickets are just £12.50 for Adults and £5.00 for Children – including your free Santa Suit and a medal for every finisher! Get your tickets HERE. Online registration closes at 15:00 on Friday 7th December. On-the-day registration will still be available! Woof, Woof, Woof… calling all dogs and their owners! For the first time this year, we are encouraging dogs to raise sponsorship when they take part in the Santa Saunter! 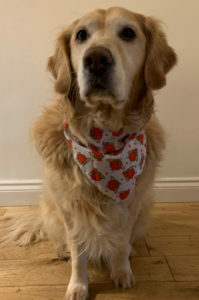 Any pooch that raises more than £50 in sponsorship will be able to collect a FREE Christmas bandana! There are a wide choice of sizes and designs available. Get their owner to purchase their Santa Saunter tickets. Set up a JustGiving page in aid of Cransley Hospice or email us HERE to request a traditional sponsorship form. Work your canine-magic! Sweet talk other dog-owners, friends and family to sponsor you. Try to hit that £50 target! When you arrive at the Santa Saunter, simply hand in your sponsorship or show us your JustGiving page and you will be able to choose a dog bandana of your choice if you have raised over £50!